Discussion in 'General breed discussions & FAQ' started by Mrsfoote, Jan 8, 2011. I can't really tell from the picture.. It looks silver to me, if it is, then it will be white when it feathers out. Yea I hatched them from 3 cedars i have 3 of them and one looks blue maybe black of course just as i find someone to sell me some splash big gilrs i hatch some. More than likely a splash. I have three splash that hatched recently and this is pretty close to what they look like. Although, I think Three Cedars has a lot of lavender splits as well, you should ask if that's a possibility from her directly. Again, probably a splash though. Is the color as uniform as the picture appears or is the chick more splotchy in person? Why do you say it is not white? It looks white, or possibly splash. because if you look at it in person picture was taken on my cell phone....compared to white then its really dirty looking. 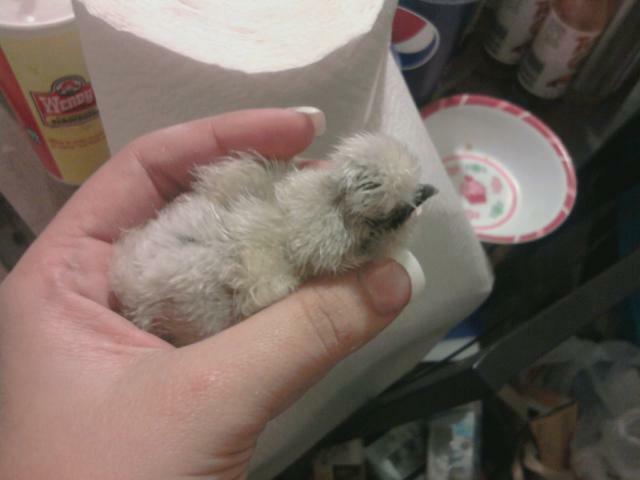 Lol I'll take some pics of it with my big camera I hatched out 3 and I'll post my white chicks pictures. The silver tint to the down can simply indicate the silver gene. If the eggs came from a well separated blue/black/splash flock,though, chances are likely that it is splash. However, as a recessive colour, white is still possible.